← JAMES FERNYHOUGH. Claim we’re on track to meet emissions targets is false. TROY BRAMSTON. Ex-Labor leader Bill Hayden, 85, baptised into Catholic Church. 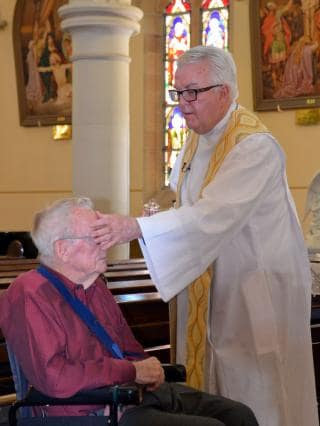 Bill Hayden, at age 85, has renounced his atheism and been baptised into the Catholic Church. The former Labor leader and governor-general said it was witnessing so many selfless acts of compassion by Christians over his lifetime, and deep contemplation while recovering from a stroke, that prompted his decision. 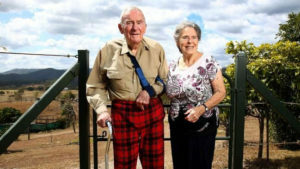 “I always regarded myself as a fellow traveller with Catholicism and declared I was a Catholic on official forms, but it wasn’t official,” Mr Hayden said. “I would go to mass every Sunday and then go to benediction when I was a teenager. I didn’t know that I wasn’t officially a Catholic, and found that out only later when my sister did the family history. “When you grow up with it, I don’t think it ever really leaves you. The Catholics have ceremony very much in place. But it was more than that. I could just feel in my heart that I didn’t feel fulfilled. Mr Hayden being baptised by Father Peter Dillon. Mr Hayden’s mother was Catholic and his father trained to be a priest. He attended a Catholic primary school, and went to church regularly in his youth, but later discovered he had not been baptised. “My mother would say there is no such thing as a bad boy; she always had explanations for others and her faith has certainly had an impact on me,” Mr Hayden said. Mr Hayden was once one of Australia’s leading atheists and humanists. He was elected to federal parliament in 1961 and was a minister in the Whitlam and Hawke governments, and served as Labor leader from 1977-83 and as governor-general from 1989-96. In a letter to family and friends, he explained that the Christian principles of “humanity, social commitment and service to others” aligned with his personal and political values, and guided his return to the Catholic faith. “Christianity represents for me the qualities I have attempted to apply in my life but from now on will strive to uphold, with faith,” he wrote. Mr Hayden described the baptism ceremony as an ethereal and uplifting experience. Troy Barmston is a senior writer and columnist with The Australian and a contributer to Sky News. This article was published by The Australian on the 19th of September 2018.